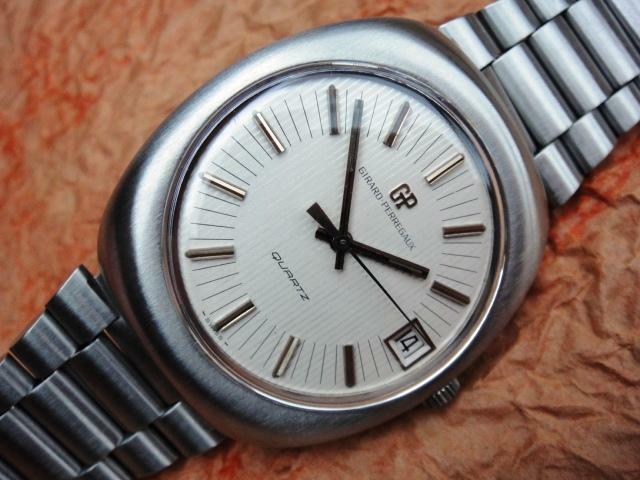 Girard Perregaux was always a pioneer in the watch industry with their inhouse research department. When CEH gathered most of the Swiss makers around the Beta21 project, GP decided to work on its own with additional funding from Jaeger LeCoultre. 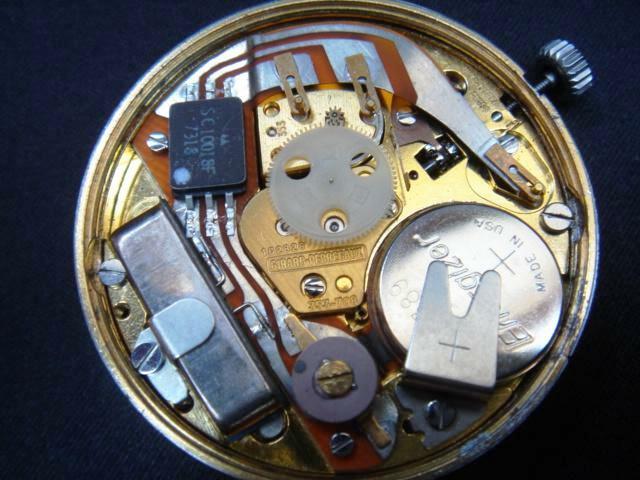 In the mid 1960's GP hired an electronics expert Georges Vuffray to develop a quartz clock and later miniaturize the technology into a wrist watch case. With help from Motorola who produced the chip, GP managed to present their prototype Elcron at the 1970 Basel Fair. 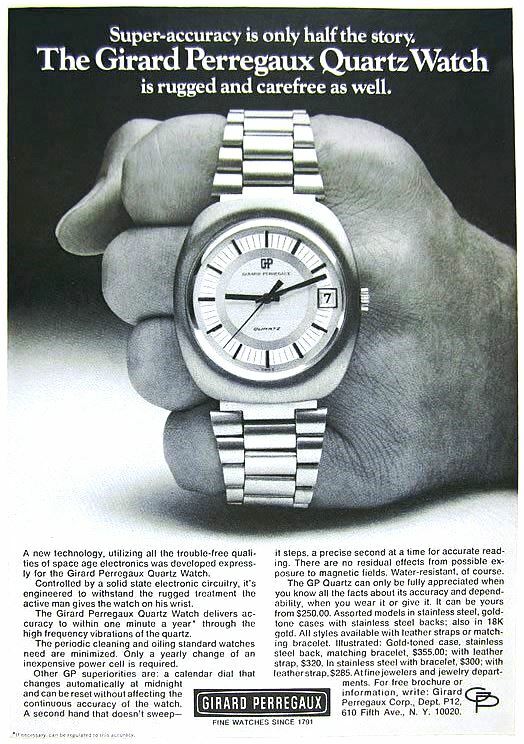 The GP movement was less complex than the Beta21 and the applied quartz frequency of 32.786Hz proved to be optimal. Until today this frequency and stepping motor technology is a World standard! To commemorate this achievement in year 2010, GP has launched a limited 40 pieces anniversary Quartz edition - the inhouse 13500 Laureato (search the web for details). This 352 calibre is the most popular from their early 350 series and was produced approx. 1972-1975. 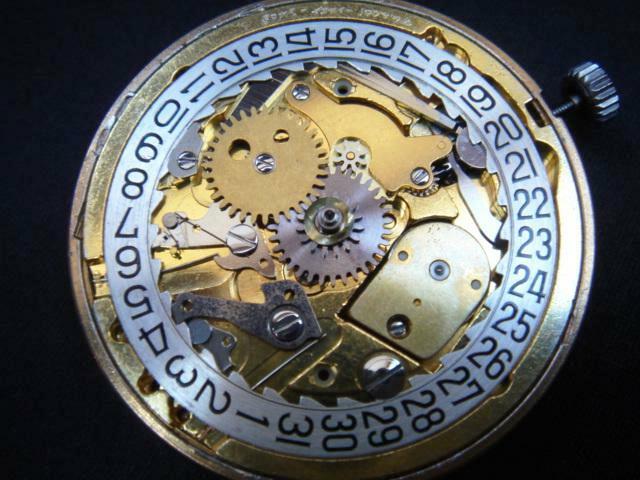 The same GP movements can be found in Jaeger LeCoultre Master-Quartz and also Favre-Leuba 32768Hz. The designs of these watches are rather classic so don't expect any fancy big size 70's models like the Omegas. The model pictured here is the nicest (IMO) of them all with a nice 70's touch on the dial. The movement consists of three main components like the Beta - the mechanical parts, the stepping motor and the electronic module - chip with quartz supplied by Motorola. The plastic gear on top looks a bit akward but it does the job nicely so there is no reason to complain. If a GP quartz does not work it usually needs a new quartz crystal but aside that you can try to open the motor assembly (pretty difficult) and check proper resistance on the coils. This one is honestly a thinner 353 calibre that takes a 386 battery instead a thicker 357 battery and higher battery clamp in a 352 calibre. Additionally the quartz crystal is placed flat/horizontally in the 353. Compare with the 352 shown in the Master-Quartz review with more exposed details. Otherwise all parts are the same.